US Dollar: March USD is Down at 95.875. Energies: April '19 Crude is Down at 58.49. Financials: The Jun 30 year bond is Down 1 tick and trading at 146.05. 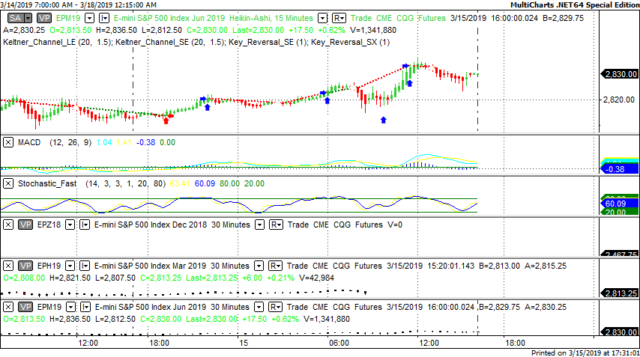 Indices: The Mar S&P 500 emini ES contract is 6 ticks Higher and trading at 2831.50. Gold: The April Gold contract is trading Up at 1303.40 Gold is 5 ticks Higher than its close. This is not a correlated market. The dollar is Down- and Crude is Down- which is not normal and the 30 year Bond is trading Lower. The Financials should always correlate with the US dollar such that if the dollar is lower then bonds should follow and vice-versa. The S&P is Higher and Crude is trading Lower which is correlated. Gold is trading Higher which is correlated with the US dollar trading Lower. I tend to believe that Gold has an inverse relationship with the US Dollar as when the US Dollar is down, Gold tends to rise in value and vice-versa. Think of it as a seesaw, when one is up the other should be down. I point this out to you to make you aware that when we don't have a correlated market, it means something is wrong. As traders you need to be aware of this and proceed with your eyes wide open. At this hour all of Asia is trading Higher. Currently all of Europe is trading to the Upside as well. Lack of other major economic news. Click on the link above to view the market reaction to the Jolts Job Openings numbers. 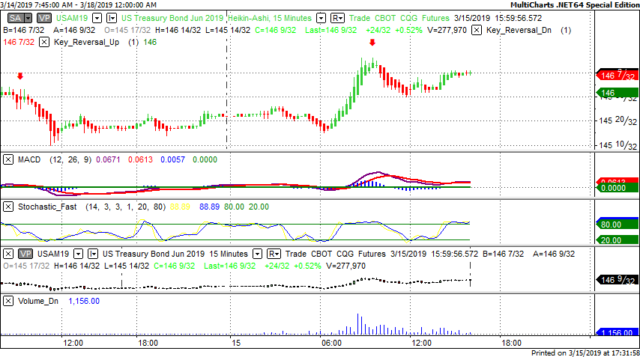 On Friday we gave the markets a Neutral bias as the futures didn't have any sense of direction at all on Friday morning. The Dow gained 139 points and the other indices gained ground as well. Today we aren't dealing with a correlated market and our bias is to the Upside. Friday looked as though it was going to be another lackluster session in the markets as this past week has proven. However that changed after 10 AM EST when the Jolts Job Opening numbers were released. The number came in at 7.58 versus 7.27 expected and 7.48 last month. So in essence this number beat out both the expectation for this month as well as the actual from last month. This is quite impressive and one that the market took note of. Click on the link above to view the action on the Dow after the Jolts numbers were reported. Today we only have the NAHB Housing Market Index number however that shouldn't be underestimated as this is major and a proven market mover. As I write this the crude markets are Higher and the S&P is Higher. This is not normal. Crude and the markets are now reverse correlated such that when the markets are rising, crude drops and vice-versa. On Friday April crude dropped to a low of $57.74 It would appear at the present time that crude has support at $57.00 a barrel and resistance at $59.00. Remember that crude is the only commodity that is reflected immediately at the gas pump. Please note that the front month for crude is now April. Last month OPEC met once again to cut production but the price of crude is starting to climb. The question is if whether this is temporary or something more permanent.